Our Journey to Kaelie: Kaelie's Room! 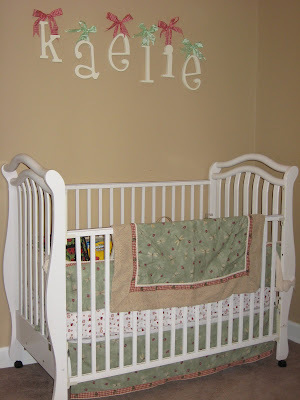 Here are a few pictures of Kaelie's nursery! Yeah! It is finally starting to come together. I have a lot left to do, but I'm glad that the furniture is in place and set up for the most part. Wall lettering: I purchased these on the internet. 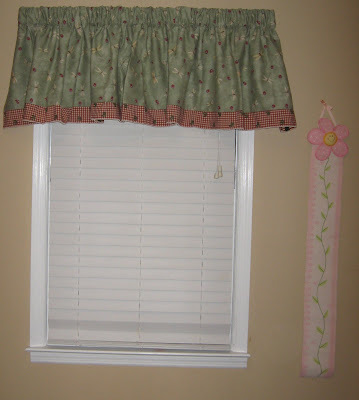 They are so cute and very easy to put up. Crib on north wall. Looks terrific with everything that was in there out of there! 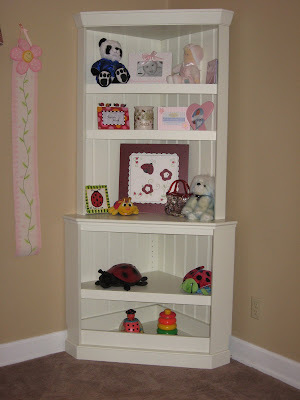 Corner hutch. This came from Pottery Barn Kids. It was packed very well and was so easy to put together. I was very impressed. This should be a piece that will last for years. I still have to install the anti-tip kit. Kaelie will have her own small TV which will go on this piece. OMG! Karen, I love it! Your colors are perfect! So warm and cozy! I love your bedding, too! Makes me want to redo mine! Ohhh Karen, It looks soooo good. I love how the name ties match the bedding! You've done a GREAT JOB!! I LOVE it! I'm really digging that bed. Can't wait to see a baby in it.